To deliver any type of corrugated cardboard container and packaging “wherever and whenever the client needs it” is the objective of Grupo La Plana in order to consolidate their leading position in the corrugated cardboard market. This could be possible with the introduction of the new digital printing technology Nozomi C18000 in their factory in Onda (Castellón), as the managing director of Grupo, Juan Ignacio Piquer, has stated today. The CEO has explained that the natural development of the firm aims to offer their clients a “greater customization of their products and flexibility to please the consumption trends”. Therefore, we do not only manufacture our own cardboard according to the needs of the client, but we can also design, produce and deliver any type of cardboard container and packaging just-in-time, reducing the production costs and the packaging stock of any industry. 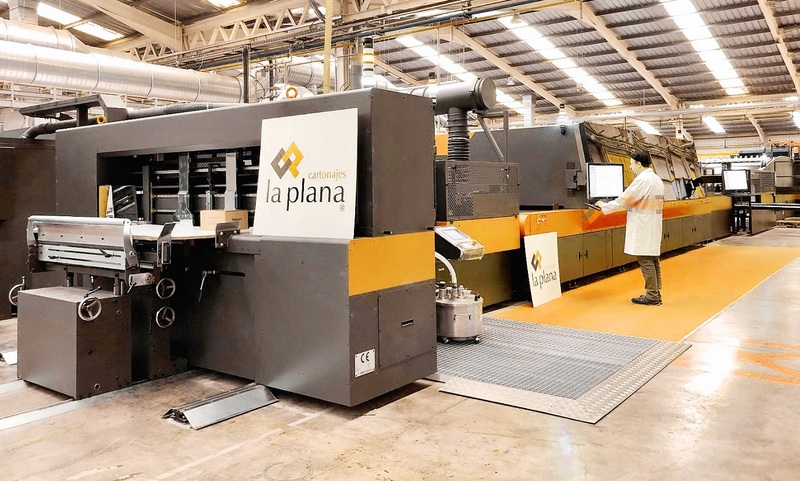 Juan Ignacio Piquer has also argued that Grupo La Plana has opted for EFI’s new printing technology, the Californian company in Silicon Valley that leads the transformation of the image production from the analogue system to the digital one. This allows them to conduct quick tests and prototypes, as well as customized campaigns with digital technology of industrial printing directly on the cardboard, simplifying the production process while reducing time and costs. In fact, the new printing centre has been operative since the past February and its versatility has been compared in order to provide more rapid and creative solutions to the packaging supply chain. The 1.8-metre-wide printer prints up to 75 linear meters per minute, or up to 10000 printing plates of 890x890mm hourly. Moreover, the Nozomi C18000 works with six colours (CMYK, orange and purple), apart from offering sharp grayscale images that compete with the offset processes and high quality flexography. For Juan Ignacio Piquer, the introduction of this innovative digital printing process enables the designer to bring their creativity to the container, thanks to the quality of the resulting images and the possibilities of the photo printing. Permanent investment. Accordingly, the managing director of Grupo has pointed out their pioneering nature and their firm decision on the technological innovation that has been based on consolidating their presence in the Mediterranean Arc over the past year, as well as in the centre and the North of Spain. The firm has invested in total more than 25 million Euros in the extension of their production centres, which will enable the production to be increased by 50% and introduce the latest technology of the sector in their installations. The company registered in 2018 a 109 million Euros billing that was turned into the manufacturing of 2 million boxes per day. “We are aware of the fact that our product has been introduced into the distribution chain of our clients”. Consequently, we cannot only confine ourselves to its selling as mere providers, but we also try to provide a solution for the needs of the new products and services”, has stated Piquer, who has also added that “we are always ready to investigate and collaborate closely with them in concrete actions”, with the presence of our technicians in the packing plants in order to adapt the product and be more efficient. Juan Ignacio Piquer, Grupo La Plana’s CEO, has argued that the introduction of the printing centre Nozomi C18000 represents a clear commitment to the digital technology in order to expand the business, turning packaging into a marketing tool that provides solutions to the market with new selling points, such as the customization, so that the products of our clients could always travel first class. The EFI’s Industrial Printing vice president and general manager, José Luis Ramón Moreno, was “enthusiastic about undertaking this journey” with Grupo La Plana as the perfect example of the strong commitment with the quality, sustainability and corporate social responsibility that shows his involvement with the digital corrugated direct printing in a single step.